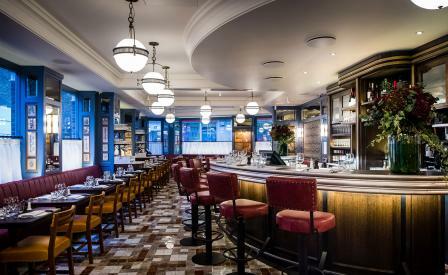 The Ivy – long a louche favourite of London’s bold-faced glitterati, society mavens and pap-shy stars who love the privacy offered by its opaque stained glass windows – has opened an outpost in Marylebone. Taking over the former space vacated by The Union Café, the small café has been designed by Martin Brudnizki Design Studio almost like a diffusion line in the sense that the DNA of the Soho flagship skates just below the surface: there is the same chummy clubby Art Deco feel thanks to the row of pendant light running down the length of the narrow room, vintage red leather banquettes, cartoon portraits, and geometric marble floor tiles. The all-day menus are overseen by head chef Sean Burbidge (ex-Pétrus) and cover every gastronomic pit-stop from breakfast (and weekend brunch) through to cream tea and post-prandial cocktails. On offer is a comprehensive blend of mod-English and Italian- and French-lite – shepherd’s pie, scones and baked rigatoni Provencal mixing it up with ham hock fricassee, Mallaig kipper with parsley butter, and a chocolate bombe drenched with hot salted caramel sauce. Meanwhile, the antique pewter top bar is a perfect perch for people watching while sipping a London Spritz infused with Earl Grey gin and prosecco, or a lethal elderflower vodka mixed with cucumber and cider sparkle.